28 years, 9 months, 22 days old age. Gurkeerat Singh will turn 29 on 29 June, 2019. Only 2 months, 8 days, 3 hours, 54 minutes has left for his next birthday. Gurkeerat Singh has celebrated the total number of 28 birthdays till date. See the analysis by days count and bar graph. 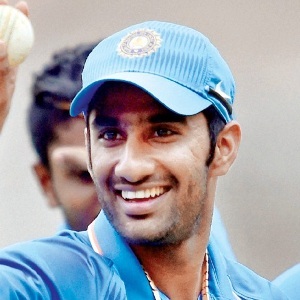 Gurkeerat Singh was born on 29-06-1990 in Muktsar in the state of Punjab, India. He is an Indian Cricket Player. Gurkeerat Singh Mann made his cricket international debut when India toured Australian in 2016. After warming the bench for the first two One-Dayers, he finally made it to the playing XI in the third match at Melbourne. He has been an intrinsic part of India A team. While he played for Punjab, he scored the score of 201 which is his highest score in the cricket career. The match was played against Karnataka. He secured a position in Kings XI Punjab which is an enthusiastic team of Indian Premier League (IPL) in 2014 and has scored a score of 342 runs so far ever for the team with 5 wickets in the addendum. Moreover, he was a pivotal player in the Tri-Nation series played between Team of India, Australia, and South Africa in the year 2014. At the young age of nine, Gurkeerat got engrossed with the hitting sound of ball on the bat as he used to stay near PCA stadium. Here aroused the dream of this talented Punjabi cricketer till he got selected in the one-day international club in the year 2015. He knows very well how to maximize his potential and turn into kinetics. This young dynamite grew up with numerous ranks from U-19 and U-22 for the team of Punjab. He was an integral part of CK Nayudu U-22 winning team. His father Rupinder Singh Mann works at Punjab Mandi Board. This Punjabi all-rounder is geared up with a lot of domestic experience. In the Ranji Trophy in the year 2013-to 2014 and 2014 and 2015, he smashed 449 and 667 runs and became the unrivaled king of domestic circuit. He began his batting at number 3 for Punjab in his first season but soon he realized he is required to adapt the batting at any sequence.